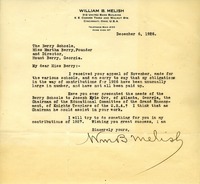 Letter to Martha Berry from William Melish concerning his lack of ability to donate to the schools in 1926. He informs her of another man to ask for donations from. In addition, he promises a donation from him in 1927.